I have finally gotten the time to read Gerritsen, Haak and Prins’ “K9 Behavior Basics”. I had been wanting to get a few hours of concentration to read through this one for the longest of time. What got me interested was the fact that Simon Prins was involved. Simon Prins is a somewhat of a R+ figure head, a pioneer in the training of police dogs who tirelessly campaigns for humane and rational methods for the training of police dogs in The Netherlands. So I put everything else aside and did a marathon-read it this week-end. It was worth it: it turned out to be an interesting book with much food for thought. Check out the sorry state of the book… This is what you get for cramming an entire book’s worth of reading in one day. 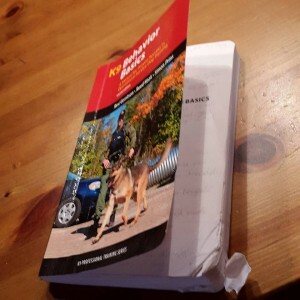 This entry was posted in Dog writing and tagged assistance dog, dog training, Dog training manual, honden trainen, police dog, politie honden, Resi Gerritsen, Ruud Haak, service dog, Simon Prins, working dog. Bookmark the permalink. Post a comment or leave a trackback: Trackback URL.